So, you know trillian_stars stars in Sense & Sensibility which opens Friday April 25th at Hedgerow Theatre and to celebrate we've been having all sorts of Jane Austen themed thingies. 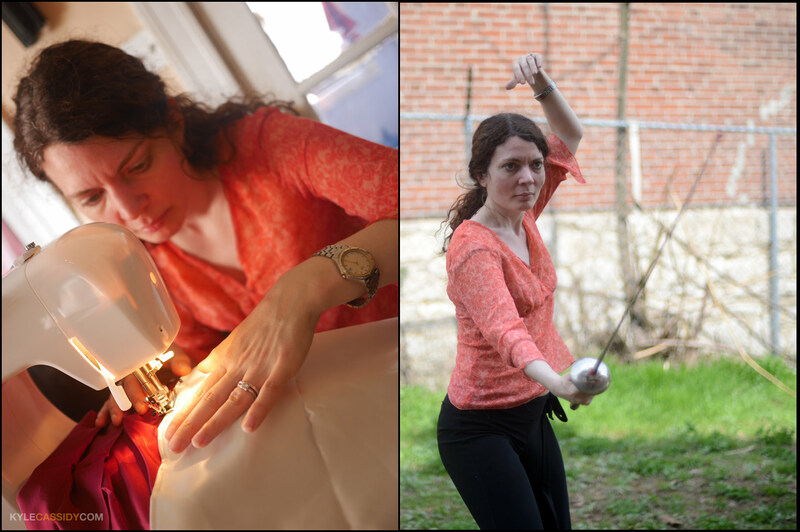 Yesterday we had a day of regency dress making and dueling. 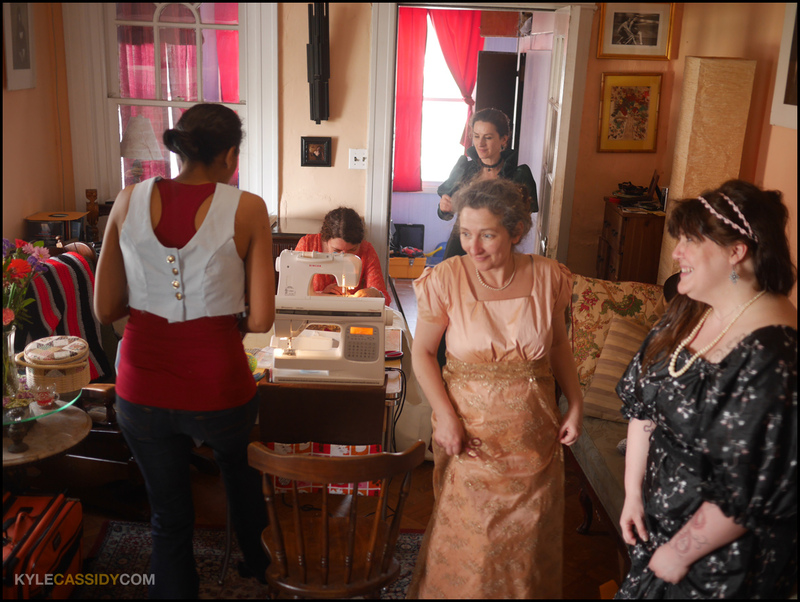 We hired dressmaker Tina Giovannone to teach everyone how to make a Regency era dress. If you didn't feel like making a dress, Sir John's hunting party ate cucumber sandwiches and went out hunting craft beers and the local ritzy bar. Dress making and cucumber sandwich eating went on for some time and then it was time to start killing one another. An hour into the dress making the fencing lessons began. Some of our dress makers were very speedy and others had started the night before, so there were a good number of people who actually dueled in their regency dresses. There were four judges and a scorekeeper for each duel. It was interesting that most people chose lines from Laertes or Mercutio as they bled out. "No, ’tis not so deep as a well nor so wide as a church-door, but ’tis enough, ’twill serve," and "Zounds, a dog, a rat, a mouse, a cat to scratch a man to death!" were both unusually popular as people toppled into the dust gripping their sides. 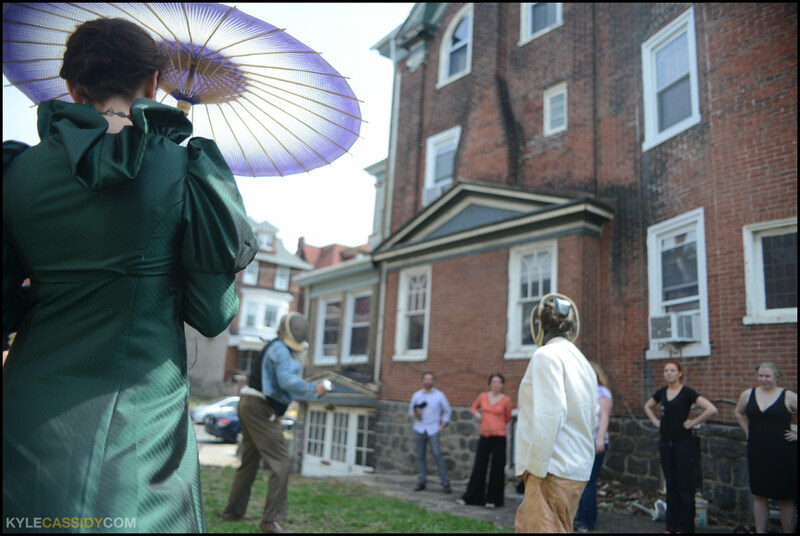 Mary watches in the dress she made while old scores are settled on the field of honor. Once half of us were dead, it was back to the dress making with great gusto. Trillian makes a dress, Trillian fights a duel! Some of us retired to the photo studio and set up some lights. Everybody got a portrait in their dress, I'd post one, but Bernard Jones and Kevin Wheeler took over the photo duties along with Amy Blackthorn so I'll have to wait for them to post things. As dresses got finished and people got their portraits taken we played Jane Austen board games in the back yard and a splendid time was had by all. Regency dress, sword or not, we certainly hope to see you at Sense & Sensibility opening Friday April 25th at Hedgerow Theatre. back yard to play the Pride and Prejudice board game. I was Wickham. Had a great time, and that is one of the few pictures of myself that I actually like. Thanks Kyle! 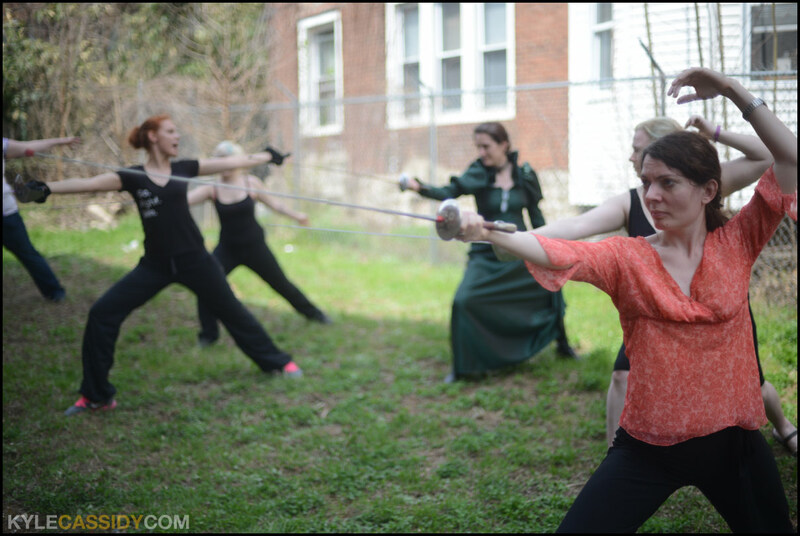 PS- I might be looking for fencing classes in my area now. Oh! And those cucumber sandwiches were delicious! If you could email me the type of mayo and bread you used, I might actually make those! it was just rye bread & veganayse. tina lead the way with a no-pattern dress. they just measured and went. That green dress is Butterick 6630. Lizzie and Mr. Darcy won the Pride and Prejudice Board Game, but considering the name of the game, I think that's kind of to be expected. Delightful! And Kermit with Envy!